Drone: a Human’s Best Friend? ELEKS, the third biggest tech company in Lviv, has more than 1000 employees as well as a hidden gem: the Luftronix Delivery Department. A few rooms on the second floor in a smartly decorated office are full of cables and different devices. 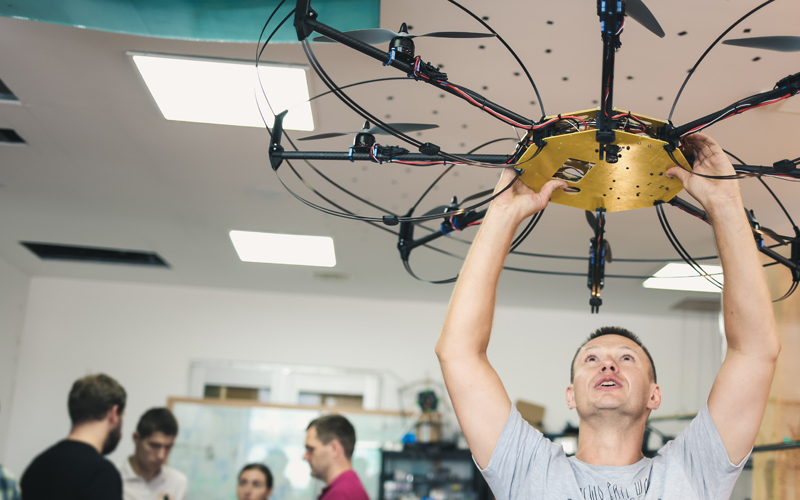 There are Lego parts on the floor, sci-fi books on the shelves, drones on the tables – all overseen by 15 engineers who make up Luftronix, one of the best teams producing drones in Ukraine! Drones are robots actively used on the mass market, anyone can buy them for private use; however, there’s still plenty of space for improvement, especially when it comes to industrial drones. 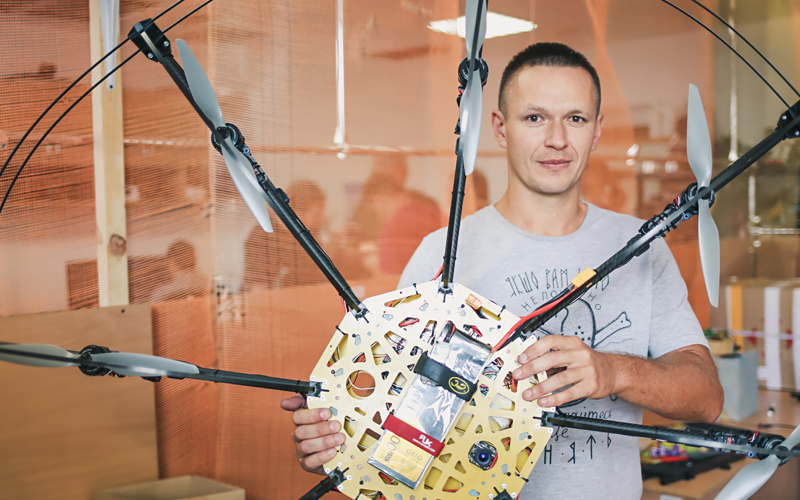 Roman Pavlyuk, ELEKS Product Manager, and Oleksandr Grachov, ELEKS Mechanical Engineer talk to us about their big drone passion, their possibilities, why we need them and how they will help humans to escape dangerous jobs. Our drones fly where no one else can. This brings many challenges and keeps us excited about producing drones. The drones we develop only fly indoors, that way they’re entirely different from the ones that fly outside. What makes our drones unique is the fact that they fly in areas without GPS. A drone doesn’t know its location and has to find its way on its own. It tries to see the surroundings through its cameras, measuring the area by signals and built-in sensors, detecting objects by 3D cameras. 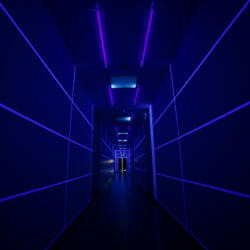 Drones understand where the walls are, as well as where they should stop or turn. Drones can be made smarter by adding on additional devices. Every drone we produce is unique and built specifically for a certain task. One of the projects we’re currently working on involves aircraft damage detection drones. All aeroplanes should be inspected after a certain amount of time. A drone flies around an aircraft and photographs every millimetre of the plane’s body, then a special program double checks the pictures, detecting any and all damages, even tiny scratches. The check usually takes anywhere from four to 24 hours, but with the help of drones, this time can be shortened. Ultimately, we want our drones to be able to complete the check in 30 minutes. In order to thoroughly inspect an Airbus А380, a drone needs to fly 3,000 square metres, so in this case, we would use two or three drones instead of one. It’s important to document every single flight an aeroplane makes. In an ideal world, it would be good to have regular images taken, starting from the moment of construction. This would allow us to monitor any changes or damages to the aeroplane. After an inspection, we could design an aircraft map and send all the scanned data and pictures to analytics. Right now, we’re working on a computer system based on artificial intelligence, which will be trained to check for damaged areas. It’s not finished yet, and that’s why humans still have to do some work after a drone completes the inspection. Airline representatives check all the pictures, control all the processes and then, finally, repair the damages. But we foresee a future where drones may be able to replace the airline representative checks. Accuracy, reliability and high-quality photography are essential for any drone. To be able to take high-quality pictures, a drone needs to be equipped with professional optics, and this can make it a lot heavier. The heavier a drone is, the bigger and longer propellers it requires. The drones we use for aeroplanes are quite heavy, but the ones created for transportation are even heavier. In the future, we’d like to work on drones for sewage systems or oil tankers. We haven’t worked in that sector before, but it seems like an area where humans could be unburdened from dangerous jobs, while simultaneously saving time and money and improving accuracy. And while we’re daydreaming, how cool it would be to inspect rockets? All drone navigation methods are based on biology. For example, some drones move like a fly, but we want them to move like a wasp. A fly doesn’t know where it is, it just flies, but a wasp or a bee can fly many kilometres and then return to its nest, which a fly can never do. Like bees, most drones can already stay up in the air without moving. If you want to work with drones or robots, you should definitely read fiction books. Imaginary worlds in books offer so many interesting ideas, some of which can be implemented now. Learning biology is also essential, in our case it’s very useful to understand insects, their behaviour and navigation capabilities. A drone isn’t just a device that can fly, it can also swim and walk. Drones are like mini robots designed for particular functions. We are living in an incredible time where fiction has come alive! We buy or order most of the drone parts from abroad: sensors, engines, cameras and boards – but we develop the navigation ourselves. If there are no high-quality parts on the market, we either build them from scratch or improve existing ones. Hardware and software need to be developed hand in hand. When we build a drone, we simultaneously work on the code and synchronise the drone’s body and movements with the software. Our software engineers make sure that the information that comes from the code will reach the drone and make it work. 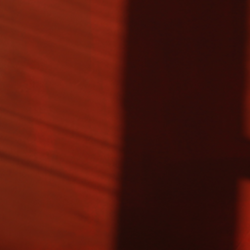 We create generations of drones, each one an improvement on the last. We change parts and install modern elements, meaning we never have to build the entire drone from scratch. Building a drone is not such a complicated task. What’s hard is programming a drone to perform a certain task. For example, we are looking at how a drone can measure objects and the area around them. We’ve been working on this for over a decade, and it seems there’s no limit when it comes to improving on your last drone. Drones are remotely controlled by a pilot. Autonomous drones are still in the process of development. For now, a drone is a tool that can help us complete tasks, but why not call it a friend? Drones and people work together, at least right now, and we believe that one day, drones will be able to decide what to do on their own. Even though we work with drones on a daily basis, sometimes we wonder, how can it fly? It’s simple physics and maths, but still, it’s amazing. When you have been working on a drone for weeks, months and years, and then it finally rises in the air, it’s such an exciting and proud moment. Yesterday, we celebrated Frenki’s birthday. Frenki is a large six-propeller drone who has already taken up three years of our time, as well as a lot of effort. It was a real party with champagne, chocolate, music and the feeling that we’re celebrating the birthday of an old friend. A pilot of a drone is almost a pilot. Being a drone pilot is a great way to make your childhood dreams come true, right? ELEKS has organised a drone school for kids where, for a few months, kids aged 4-14 have been learning how to control a drone and have even tried racing it. It was an amazing experience. The kids were very interested, and they don’t think of drones as toys, they take them seriously. We’re also planning to launch similar courses for adults. In the USA and Israel, military aircraft pilots aren’t allowed to become drone pilots. Sitting behind the control wheel of an aircraft and staying on the ground controlling a flying object requires an entirely different vision. Drones fly in a different way than aeroplanes, and I think for aircraft pilots they are boring. On the contrary, if a person has never experienced anything similar, it’s very exciting. Unfortunately, drones are still quite dangerous. If a drone falls, it can seriously hurt someone or even kill. There are a few strategies that can enhance a drone’s safety system. If something happens to one of the engines or a propeller, there are always reserve propellers that can help a drone to land safely. If any problem occurs, a drone tries to land slowly, but confidently. If an active safety system doesn’t work, there is still mechanical protection – extra elements aimed at reducing the kinetic energy. There’s also preventative maintenance, a system that can predict the future damages of a drone. And finally, a pilot with a controlling panel also plays an important role in landing the drone safely. Each drone engine can work for 160 hours, after that, there is no guarantee for how long it will last. People, or costly objects such as aeroplanes, can easily become a drone’s victim. Therefore, it’s very important to continually improve a drone’s safety systems by synchronising software and hardware. Media and event organisations film the crowd during events without realising just how dangerous it can be. In the USA, for instance, there are only three companies licensed to fly over crowds.